Shirley Sexton and Grayson Holbrook recently delivered gift packages containing pajamas for each Letcher County child who is now in foster care. 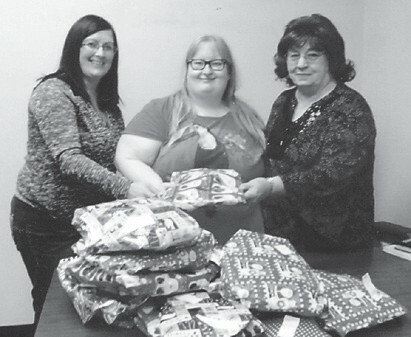 The women presented the gifts to Heather Caudill, who will distribute them to the children. Hello, everyone! It is beginning to look and feel like Christmas in this part of the Ohio Valley. We had snow for a couple of days, but it barely covered the ground and disappeared. But it has really been very cold. I can’t seem to get warm no matter how many layers of clothes I put on. Here I am complaining and winter isn’t even officially here yet. Is your Christmas tree up yet? I am going to try this weekend to get mine put up, but I can’t seem to get in the Christmas spirit. My son Keith Ballard goes to work before daylight and it is already dark now when he gets home. Keith works in construction and is almost always working outside no matter the weather condition. He keeps warm by wearing two pairs of coveralls and an assortment of rain gear. I am so old fashioned that I feel I need to prepare a hot supper each for him each night, but he tries to tell me he will fix something when he gets home. The only thing Keith is particular about is that he doesn’t care for the white meat of a chicken, so I usually buy legs and thighs and fry them for him. How many remember chicken legs and thighs being called long thighs and short thighs? My memories take me back to Mommy fixing supper for Daddy and us kids. How in the world Mommy knew what time to have supper ready I still cannot understand. Mommy would always have Daddy’s bath water ready for him, as she would put a portion of cold water in a number two wash tub, then when Daddy was ready for his bath Mommy would add a teakettle and a pan of hot water to the water already in the tub. Daddy would get on his knees to wash his head and face and upper part of his body, and then run us kids out of the kitchen while he got in the tub to finish his bath. What I wouldn’t give to have Daddy and Mommy alive now so they could enjoy some of the finer things they never had when us kids were small. I was reading comments about the newly elected officials in the Speak Your Piece section of The Mountain Eagle. Please give the new ones a chance before you start to condemn them. I really don’t have any right to state my opinion about this since I don’t live in Letcher County, but that hasn’t stopped me yet. Mickey Stines was voted in as sheriff, so please give him a chance. Mike Watts has gotten a few smart remarks made about him, too. I know one thing: Mike has more class about him than I could have ever managed. I am glad he was chosen for the position. Before I get off my soap box, what about the roads in Letcher County? Who is in charge of repairing them? Before you know it spring will be here, and the old gravel road to the Coots Cemetery will still have not been touched for sometime, even though there are a few veterans buried in that cemetery. My Dad is one of those vets, and the road is so bad that I can’t get my car up it. It was really good to hear from Pat Wagner and Les. They enjoyed a couple of days in the Smokies to celebrate their anniversary and enjoyed the trip except for the traffic, which was extremely heavy. Les and Pat always like to go to Cades Cove, but they were in traffic for quite sometime getting there. At least the weather was great. On the way back they made a detour to their place in the mountains of eastern Kentucky. Les and Pat along with Becky and Polly Hasty traveled to the mountains to attend a wedding. Congratulations to Vincent and Vena Shell. Vena is the daughter of Mike and Valerie Ison. Brothers James and John Ison started reading my column when they were very young. My niece Sue Hall attended this wedding, as Kaya and Izzy took part also. Johnny and Ann Calihan are trying to stay warm. Ann is still having some problems with the skin cancer. I know she will be glad when this is healed. Sue Wagner got to spend a week at her home in South Carolina. She is now with Johnny and Ann for more testing. If all goes well Sue may get put back on the liver transplant list. Please keep Sue and the family in your prayers. This has been a rough year for the Calihan family. I used to hear from someone in Florida who reads my column. Actually it was three guys from the Blackey area, and they came to Blackey Days to meet me. I think one was a Breeding. I haven’t heard from them in quite sometime. If they are still reading my column, I hope everything is all right with them. Sunrise Ridge is really busy. I wish I was able to be at every show they play. It is so tempting to head for Campbell’s Branch as they play there December 14, but I am scared of the weather. Plus that is too close to Christmas, and with Santa Claus getting into my purse I have to be careful. Each time I see a post on my computer, I want to head for the Carcassonne Community Center to a square dance. If God is willing I will attend the first dance in March, if weather permits. It was good to talk to Marcia Caudill, as she and Mike spent Thanksgiving with Mike’s mom in Louisville. My grandson Bennie Widerhold, who is 11, is at the age that the truth about Santa Claus is told, and now he wants to go pick out his presents himself. As usual I am running short on time. Until next time, Rose Ballard, 9110 Lawrenceburg Rd., Harrison, Ohio 45030, email: Bluegrassmama4@aol.com.